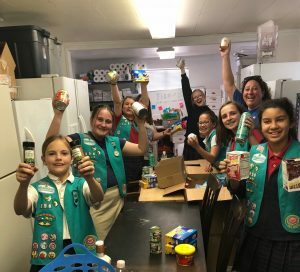 Our Christ Lutheran Girl Scout Troop serving the community by helping Feed Our Babies put away a large donation from Midwest Food Bank. Feed Our Babies Pantry opened last year for our wonderful families. Our refrigeration and freezer capacities allows for us to receive healthy fruits, vegetables and other perishable items for our families. Fruits and vegetables are packed with vitamins and minerals that our kids need for healthy brain development and overall growth. Our pantry shelves are often stocked with healthy selections of canned and boxed items. Coming soon: Feed Our Babies Pantry Expansion! Plans are in the works to double in size. Stay tuned for developments and reach out to us if you are interested in getting involved.